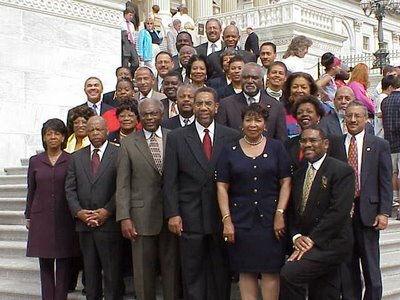 The book “Game Change” revealed that President Obama despises most members of the Congressional Black Caucus (representatives of his most loyal base), but when lacking votes, the president never fails to come calling on them for support. As POLITICO reported a large number of Democrats, led first by Sen. Elizabeth Warren, have been opposing the trade deal Obama is negotiating with Republicans. Minority Leader Nancy Pelosi said it is not her responsibility to help House Republicans pass this trade deal, so Obama is once again calling on the Congressional Black Caucus, a group that will usually support Obama no matter what. The Trans-Pacific Partnership is a pro-corporation and anti-labor deal, but that isn’t stopping Obama from asking CBC members to get in line. At least some CBC members are pushing back against the clarion call from Obama this time around. Representative G. K. Butterfield, Democrat of North Carolina and the chairman of the Congressional Black Caucus, said the solidarity pitch “could be a factor.” He met personally with Mr. Obama in the Oval Office, he said. The problem is, black lawmakers tend to represent poor urban districts that have seen the glittering skyscrapers built by United States corporations flourishing in a global economy but have seen very little of that wealth find its way to constituents who struggle for jobs and pay raises in the face of fierce globalized labor competition. Mr. Obama should count that as a small victory. Most minds are made up in the Black Caucus, which did not give George W. Bush a single vote when he won trade promotion authority in 2002. As hopeful as this article would like to make it seem, we all know they will cave in some form, in the end. Even now after being well known his (Obama) disdain for the CBC, they will still cow tow in exchange for… well, nothing. JMLewter Obama is the poster child for all things wrong with the black political elite. They are your color but not your kind. Complaing about politicians is a waste of time. Get your money together and put your dollars behind your votes. Obama is controlled by money and so is the CCB. Black folks have no organizations to lobby these politicians and thus will always be on the outside looking in. It’s frustrates me that some of people continue to allow themselves get bamboozled and hoodwinked by these sorry ash people.. They’re no different than some of these bootlicking preachers who prey on the misinformed.. We need to change there names from Rep to Stephen after the character Samuel Jackson played in Django..
LOL @ the Django reference … but, it is fitting for the most part. For some time now I’ve discussed how, for the first time in history, too many Blacks have been programed to support their own abuse and demise in the “Age of Obama” and are proud of it. The TPP is a perfect example of that. While I’ve not seen a poll to that effect, I’ll wager that large numbers of Blacks (perhaps the majority, even if not ignorant of its content) support the president in his efforts to undermine their well-being. While many members of the CBC are corporatists with no interests in serving their constituents, to be fair — those few who do wish to serve are in a “double-bind” situation (between a rock and a hard place). On the one hand, if they vote in the interest of their constituents by opposing TPP, they fear their constituents will vote them out of office if the president tells them to. On the other hand, they know that if they vote in support of the president’s GOP policies they will be destroying their own community. That is what I mean by Blacks supporting their own abuse and demise. Many of them have even attacked Dr. West and others for speaking out on their behalf. As far as the president’s relationship with the CBC goes, it was clear to me that he disdains them when he refused to meet with them for, according to some accounts, 2.5 years after assuming office in 2009. While many, not all, in the CBC clearly do not do their jobs, I believe credit should be given where it’s due. For example, some of them helped stop the president from cutting Social Security, pensions, and programs for the poor in his “Grand Bargain” with the GOP. They must stand firm again against TPP and similar trade proposals. Proposals that are not about trade at all, but are about increasing corporate power and transferring wealth to the rich. The TPP has been under discussion throughout the Obama presidency, but it had no chance of passage unless President Obama could get what he’s always wanted– a GOP controlled house and senate that share his core right-wing values. Now that he has that, he’s at home — in his element. Recent history shows a pattern of repeating mistakes. This is NAFTA all over again. All we need now is more bank deregulation and a tough on crime bill. vampirehunterg1 Indeed. They both delude many of us into thinking they represent progress while ushering in policies and turning a blind eye to practices that damage us. They are a necessary tool to maintain the system of White Supremacy. HANNIBAL the VICTOR I agree. I would encourage that practice specifically with local politicians. Control your Councilman, alderman, school board rep, etc. first. Then as your collective power and influence grows so will our ability to make change. But none of this happens without cooperative economics. None of it. HANNIBAL the VICTOR Check out http://www.iamoneofthemillion.com/ The OMCBV&C is a new Black organization that believes in “Stacking paper” for elections. Only in a photo op like this will you get such a concentration of high profile, self-serving Blacks in such a small square footage footprint. Well, looks like we won round 1. The house voted down the TPP … FOR NOW! But, u can rest assured the corporate lobbyists will reintroduce it at a later date with perhaps a different name and with even more secrecy, so we need to keep our 3rd eyes and ears open on the future developments of this issue. U know they ain’t gonna quit that easily .. they’ll come back even harder next time and apply even more pressure on those congressional members who voted it down THIS TIME … that’s how they work. Remember how they kept tryna push the proposed CISPA legislation after the SOPA legislation that got rejected? Chris40 A breath of fresh air. Do your due diligence on this organization and if you like what you see put your money where your mouth is and DONATE! Watchful I dont blame lobbyists for trying to have influence in the government. Thats the way the game works. Black people need to get into the game and stop hoping things go our way. I didn’t ‘blame’ them either, I was just stating how they operate when the corporations they represent wanna push thru certain legislation. I’m not sure how u took my comment as me somehow implying that we should sit back and ‘hope’ for things to go our way either. I suggested that ppl stay informed on any future attempts to reintroduce this so-called ‘free trade agreement’ bcuz they will most certainly pursue their efforts again. They ALWAYS do. We have to constantly monitor any renewed efforts they mount and in order to do that we have to make use of the various alternative news and information sources available to us bcuz the mainstream media isn’t gonna provide the kinda in-depth coverage that we need on an issue like this. Watchful I didnt accuse you of anything. Im making an observation of what i see black people doing politically to protect themselves. It doesnt look good. Ok, my bad … I musta misinterpreted ur comments. I actually agree with u that we need to be much more active and become much more informed on the political issues and proposed legislation that will have a negative impact on our ppl. The thing is, these untrustworthy politicians try to sneak alotta this legislation thru in secret meetings and backdoor deals so we’re often not even aware of it til after the fact. And the bought and paid for mainstream media that most ppl rely on to stay informed refuse to cover issues like these in an in-depth manner and give them the kinda extensive coverage they really deserve. That’s y I’m such a strong advocate and supporter of alternative media outlets because they work to provide us with the truth and facts we need to arm ourselves to fight against things like TPP and TTIP. We really need to stay on top of this bcuz they r definitely gonna try and push it thru again and will be even more secretive in attempting to do so. Didn’t take long for ’em to make their next move to push TPP thru … I told ya, they don’t quit easily. So let’s see … there’s the TPP, the TTIP, the TAA, the TPA …. oh yeah, and also the TiSA. When will it all end? Well, it’s a done deal now, just like I knew it would be. The criminal, bought and paid for congress has gone right along with the criminal, bought and paid for POTUS to ‘fast track’ this ultra secretive so-called ‘free trade’ agreement which is anything but. Hugely disappointed in Obama for passing this deal. It seems that Sen. Elizabeth Warren is one of the few principles Democrats left. This is why I don’t trust either party, regardless. Is there really any difference between a Democrat and Republican if you look close enough? And using the “The Republicans are racist” argument doesn’t wash. They both serve the same God: the corporations. Johnw11 The answer is really quiet simple, until you have a black person who funds candidates in the way whites fund candidates you can forget about politics. As it stands someone like the Kock Brothers will literally set aside $100 million and tell a candidate, we will finance your entire campaign with the understanding you work for me. Black folks don’t have the money to combat that. The black folks who stand up for blacks in congress get marginalized and wouldn’t be able to run a campaign because black people don’t donate enough money to actually have candidates. Problem is typically their campaigns are funded by non-blacks. That is why, they represent non-black interest. Once they start talking black they can kiss their job goodbye. Funding is gone, $$$ runs campaigns. At best you will be a lone voice on capital hill. I agree with you, but politicians are also selfish. Without moeny politics is not a game blacks should get involved in. Until there are black people who put together $100 million and say you are going to be my candidate and do what I want, they can forget the whole idea of politics and just focus on acquiring money through economic powernomics community.